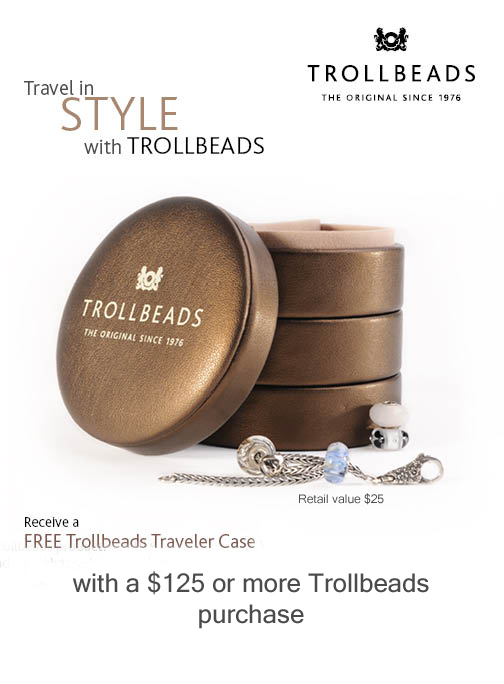 Trollbead Boutique has a brand new promotion starting today: for any order over $125USD receive a free Trollbeads 3-tier storage case. This offer is good while supplies last and is a $25 value. The case is beautifully done in bronze faux leather with a cream interior and it is similar to the multi-layer storage box in black leatherette that can still be purchased in the UK (but was never available in the US, see below). I’ve coveted the black storage box since I first started collecting Trollbeads so I’m very happy to see this bronze version available here! Trollbead Boutique provides free shipping and will post internationally as well. I hope these promotions are enough to get you excited! What do you think of the 3-tier bronze storage box? Tempted to get one? The box is great (love the color) but I really don’t need another storage box. Trollbeads has such amazing glass beads, but I haven’t bought any. Yet. The upcoming trunk show might be my downfall! 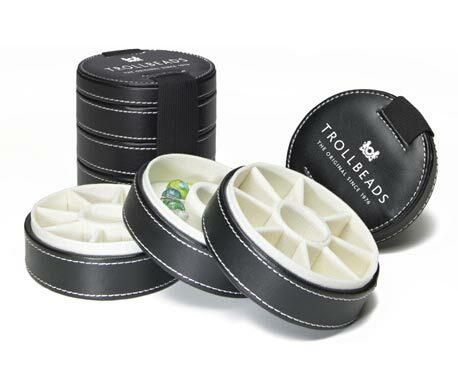 It might be time to get my first Trollbeads bracelet. I just found a silver/glass bead that I love, Palm Island, that would work so well with the summer/Hawaii bracelet I’m planning. I wonder if this bead would fit on my Pandora bracelet too, it almost looks like it might the way it’s made. Dangit, I’m spending waaaay too much, lol. I loooooove Trollbeads glass, it’s really what got me into Trollbeads! 🙂 The Trunk Show is a fantastic time to get into this brand. You know, Palm Island’s core looks big enough to fit on a Pandora bracelet…or you could get a Trollbeads bracelet? XD The flower, seahorse, or dolphin clasps would be perfect to represent summer ;). Ashley, the Conch bead is definitely on my wishlist! Since I’m already planning on buying many of the Sea charms from the Pandora summer collection, I’m thinking my first Trollbeads bracelet will be in a summer/beach theme. If you like Conch, you should do a summertime/beach theme! I really really love the beach kit (I’ll be doing a review in the coming weeks) and it includes beads with a lot of textures. Plenty of charms to choose from the Trollbeads spring 2013 collection. A lot of my Trollbeads bracelets don’t even have a theme, but they’re based on colors I like to see together and silvers that are interesting to me :). Let me know if you need more help! Are these promos only available online or in Retail Stores as well? I’ve been on a buying spree and the addiction is getting crazier by the day! I’m glad you could order it separately! It looks great, I can’t wait to get mine :D. Both sites are great, the pink prisms are awesome. They’re really a unique color, somewhere between purple and pink. My aunt has this box and It’s a great for travel.its smaller than you think and not room for a lot of beads. She often takes it in her purse and with her on the go. The thick elastic really holds it together. I likely will place an order just to get my own version. I just noticed that this box is different than the British version and doesn’t have the elastic band. Oh no, disappointed! !